EXETER, NH - The Seacoast United Phantoms and Long Island Rough Riders fought out a tough draw with both sides feeling like they could have won it. The Phantoms had a clear plan in mind, to bounce back from a disappointing loss to GPS Portland Phoenix last weekend knowing that a win would keep them in contention at the top of the table. The Rough Riders started the game on the front foot however and found themselves with their noses in front early on. Midfielder Dom Marshall scored and it was an uphill battle for the Phantoms inside the first 20 minutes. The Rough Riders had a couple more chances and the Phantoms defense did well to keep the score line at 1-0. As the game progressed the Phantoms started to grow into the game with Terence Carter seeing his headed effort go just wide of goal. The Phantoms knew the added pressure would pay off and it finally did when they were awarded a penalty after a clumsy foul inside the box. Andre Simmond converted from the spot and the score line was level. The remainder of the half saw both sides exchange some good efforts but at half-time it was 1-1. The second half picked up where the first half ended with both sides testing their luck in front of goal. The Phantoms kept building up pressure and it paid off once more when the Rough Rider defense conceded a second penalty. Andre Simmond stepped up once again and tucked the ball away giving the Phantoms the lead. The Rough Riders ramped up the pressure having fallen behind and created several chances. Phantoms keeper Andrew Pesci did his best to keep the Rough Riders at bay but they drew level thanks to midfielder TJ Butzke. The final score finished 2-2 with both sides frustrated at not taking all three points. 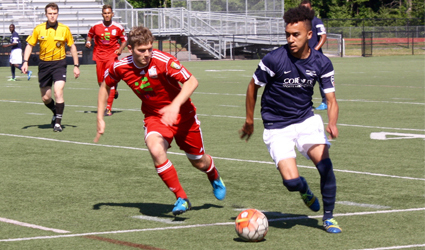 The Seacoast United Phantoms compete in the Premier Development League (PDL), with a roster consisting of collegiate, post-collegiate, and international players looking to further their development during the summer months. For more information on the Seacoast United Phantoms, please visit www.seacoastunited.com/phantoms.